Liquid organic fertilizer gives plants added nutrients in a faster-acting form than granular fertilizer. 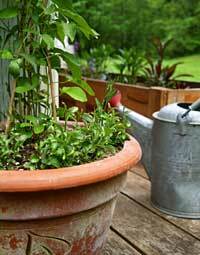 You can apply it with a watering can monthly or every couple of weeks during the growing season. You can also apply it to foliage, as plants can absorb nutrients through leaf pores. This “foliar feeding” is often done with fish emulsion or liquid kelp. Fish emulsion is made of fish byproducts dissolved in water, which contains 4 to 5 percent nitrogen and about 2 percent each of phosphorus and potassium. This fertilizer gives seedlings and transplants a good start. Kelp (a type of seaweed) is available as dried meal or a liquid extract. Used for centuries as a growth enhancer, it is a good source of potassium and provides some nitrogen, and more than 60 trace elements. Studies suggest that kelp gives plants a boost by helping them absorb soil nutrients more effectively. As with all fertilizers, follow label directions for foliar sprays – because a little is good, more isn’t necessarily better.